Jon Foreman suffered an injury while surfing and Switchfoot is going to have to postpone their show til Monday Feb 3. All tickets purchased for the Jan 15 date will be honored for the new date. If a person is unable to attend for some reason, they may ask for a refund. The band, minus Jon, are still planning on coming down to the Casbah tomorrow night to hang out with their fans and hand out copies of the new #1 record Fading West along with downloads of the new DVD. Very sorry for any inconvenience - please share this information. (San Diego, CA – January 14, 2014) Grammy-award winning rock band Switchfoot will postpone their hometown record release show originally scheduled for Wednesday night at the Casbah due to an injury within the band. 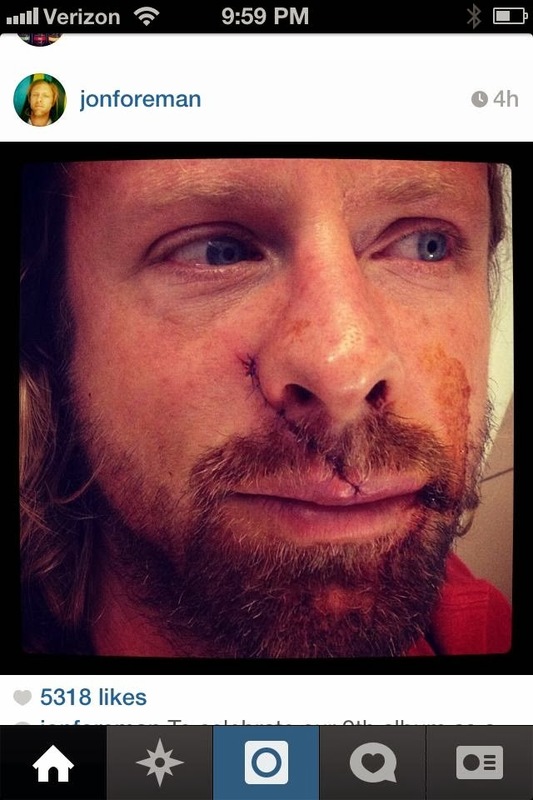 Singer Jon Foreman was treated for a wound sustained to his face during a morning surf session in Encinitas on Monday, and though he will fully recover, he will be unable to sing for a few days. The concert has been rescheduled for Monday,February 3rd, and tickets will be honored for all current ticket holders. in your own backyard! Thankful that I’m okay – it could have been much worse,” says Jon Foreman. Fans with tickets to Wednesday’s sold-out show are still invited to come to the Casbah at 8:00pm for a record signing (a copy of Switchfoot’s new album, Fading West, which was released today, was included in the ticket price) and meet and greet with Tim Foreman, Chad Butler, Drew Shirley and Jerome Fontamillas. Wednesday’s “hangout” at the Casbah will offer fans a chance to casually hang out with the band and get their copies of the new album. Fans should bring their tickets for entry. "We never want to miss a party, especially not our own. Although Jon is still unable to sing due to his surfing injury, the rest of us will be hanging out, handing out copies of the new CD and celebrating the release of Fading West at the Casbah," said Tim Foreman. In fact, Switchfoot has a lot to celebrate with Fading West holding the #1 spot on iTunes this week.